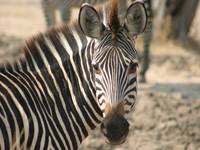 Cape Mountain Zebra are found in certain mountainous regions of the Western and Eastern Cape regions of South Africa. Listed as Vulnerable by the International Union for Conservation of Nature, the total population is only 4,791, and 48% of the smaller subpopulations have less than 100 individuals. The subspecies also suffers from a low reproductive rate. The loss of genetic diversity came from uncontrolled hunting in the 1950s which reduced the population to only 80 individuals. The lack of genetic variation and risk of inbreeding may have made populations susceptible to a disease called Equine Sarcoidosis. In 2006, this infected two populations in Gariep Nature Reserve and Bontebok National Park. For these reasons, Cape Mountain Zebra must retain the highest level of protection under Appendix I. Proposal 6: Downlist from Appendix I to Appendix II. The proposal incorrectly argues that by downlisting to Appendix II, to allow for trophy hunting, landowners would be motivated to maintain herds and expand the population. However, South Africa is already exporting trophies and the species is still in decline so this rationale is poor, with 11 skins and 5 trophies exported between 2010-2014. Populations are small and the lack of genetic diversity is also a threat. The species meets the criteria for Appendix I: small wild population and very small subpopulations; significant historic population decline; vulnerability to intrinsic (low genetic diversity, low reproductive rate) and extrinsic (disease) factors; traded internationally; trade may be detrimental.